We are delighted to invite you to the next deVine Club "The Odyssey of Grand Cru Bordeaux Wines" Wine Dinner due to take place on Friday, 25 November 2016. 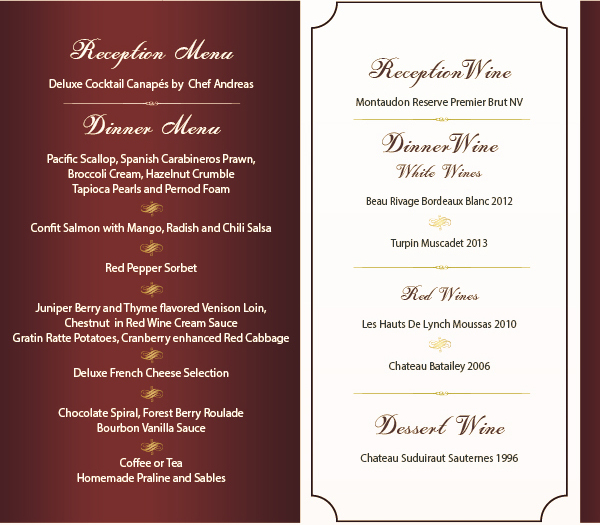 Experience a delicious 5-course menu featuring excellent cuisine prepared by Royal Cliff's Executive Chef and his talented culinary team, along with premium wines from Bordeaux, one of France's leading estates. The evening will commence at The Bar of the Royal Cliff Beach Hotel at 18:30 hrs. Dinner will be served at 19:15 hrs. at the Royal Grill Room and Wine Cellar - Excellence and Heritage. Borie-Manoux is one of the biggest family-owned French winery and wine merchant groups with a strong position on the home market exporting to around 90 countries all over the world. 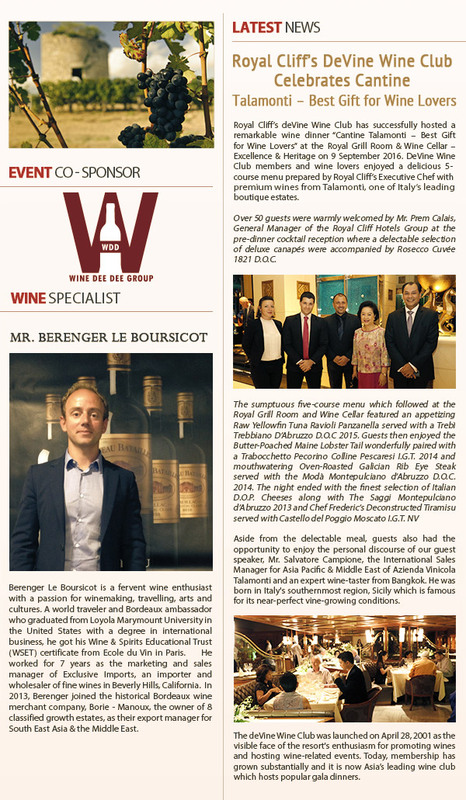 We are proud to have Mr.Berenger Le Boursicot who returns as our wine speaker for the evening. A world traveler and Bordeaux ambassador who got his Wine & Spirits Educational Trust (WSET) certificate from École du Vin in Paris, he is a fervent wine enthusiast with a passion for winemaking, travelling, arts and culture. He worked for 7 years as the marketing and sales manager of Exclusive Imports, an importer and wholesaler of fine wines in Berverly Hills, California. In 2013, he joined the historical Bordeaux wine merchant company Borie – Manoux, the owner of 8 classified growth estates, as its export manager for South East Asia & the Middle East. I am certain that this is going to be another memorable night for all of us. As wine aficionados and valued deVine Club members of the Royal Cliff, we are pleased to provide you with this great opportunity to be able to taste and experience the variety and quality of the famous wines from Borie-Manoux. We look forward to see you in this event.